Are you ready to WIN the PRIZE? Are you ready to SELL and EXHIBIT your fine artworks and collections? Please never to register as late as 2018 space is over! Bank Name: Taiwan Business Bank, Chung Shan Branch. 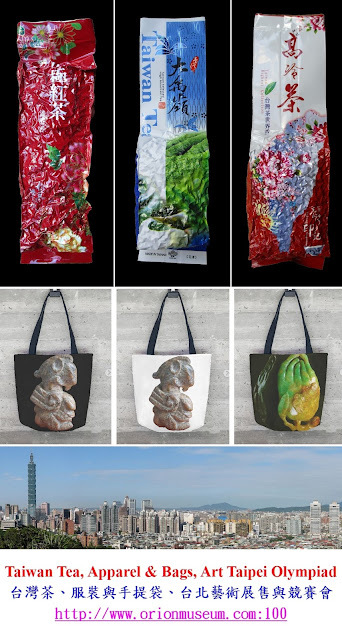 Account Name: Orion Group Art Fair and Art Olympiad Co., Ltd.
(3) With the above two procedures, you will receive a "Confirmation Letter of Registration" email within 7 working days! There are 5 million students in Taiwan and 1.2 million of them are studying in the great Taipei city area where nearly 10 million people live and work daily. The instant huge cash fund raised from the ticket money of School groups by their basic art-training course visits can let the organizer clean up and buy up almost all the unsold "fine and well-done" exhibits left by other world and local art business/investment buyers on the last day of exhibition as possible as it can be, unless your fine ones are absent! Governmental Subsidiary Payments are subject to filing application requests to both the Taiwan Government and the Taipei City Government not later than April 30th, 2018. If the selling price is US$ 2 million and the claimed insured amount is just US$ 1 million, then the art insurance price is 1% of US$ 1 million, US$ 10,000 that covers US$ 1 million of insured coverage amount! Vertical ink and color on paper, mounted and framed, signed DAQIAN ZHANG YUAN, inscribed, with three seals of the artist. Splashed ink and color on silk, mounted and framed, signed YUAN WENG, inscribed WRITTEN AT LAKE WUTING IN AUTUMN OF YEAR 1967, with two seals of the artist. Ink on paper, calligraphy hand-scroll, titled THE BUDDHIST SUTRA OF THE HEART OF PRAJNA TRANSLATED BY BUDDHIST MASTER XUAN ZANG, dedicated TO MR. TAO BAICHUAN, signed YU YOUREN, with one seal of the artist. Splashed ink and color on gold sheet, mounted, signed 82 YEARS OLD MAN YUAN, inscribed RAIN OVER A POND WITH BLOWING FLAVORS AND REMINDFUL DREAMS ON MAY 30TH OF YEAR 1980, with five seals of the artist. Ink and color on paper, mounted, signed and titled 1947 AUTUMN LUNAR JULY AFTER ZI JIU (Huang Gongwang 1269-1354) RISING AND WARM GREEN MOUNTAINS AT DAFENGTANG ZHANG YUAN, inscribed LISTENING TO THE SPRINGS BELOW THE MOUNTAINS, VISITING OLD FRIEND TO THE SOURCE OF PINE TREES, ARRIVING NOWHERE IN THE DEEP MOUNTAINS, HAVING AN APE HANGING ON TOP BRANCHES OF A TREE, with three seals of the artist. 《The Rising and Warm Green Mountains》by Huang Gongwang (1269-1354) Yuan dynasty has been lost and not capable of researching! 《After the Rising and Warm Green Mountains by Huang Gongwang》 by Wang Shimin (1592-1680) dated 1670 Qing dynasty (collected by Taipei National Palace Museum, museum No. NPM Painting 002374N000000000, Size: H 63.5 x W 29.3 cm, vertical ink on paper, mounted and scrolled. ), is a reference painting. Ink and color on gold sheet, Mounted, signed 81 YEARS OLD MAN YUAN, inscribed RAINS ARE FALLING UPON THE RED WINDOW FENCE WHEN YELLOW MOON COMES OUT, THE FIRST TRYING ON NEW SILK CLOTHES LET YOU FEEL ANCIENT FIVE DOLLARS LIGHT. 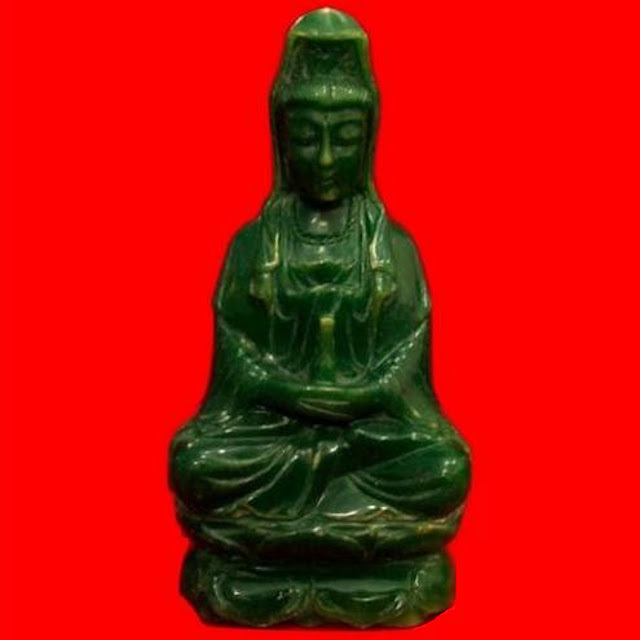 THE WORDS THAT YOU ARE SLIGHTLY COMPLAINING OF GREEN PENDANTS AND RED COSMETICS, ARE NOT FIT FOR THE LOVELY AFTER-BATH AFFECTION OF THE EMPEROR'S CONCUBINE NAMED JIANG, YEAR 1979 JI WEI SUMMER MONTHS AT RESIDENCE MOYEJINGSHE, with six seals of the artist. The inscriptions of Zhang Daqian in this painting are the same as those 28 words in 《Lotus》 by Zhang Daqian dated 1963 (H 67 x W 132 cm, mounted, Auction Record: Christie's Hong Kong 1998 Spring Auction Lot 070 on 04/26/1998.). Besides the inscriptions of Zhang Daqian in this painting are also the same as those 26 words in 《Lotus》 by Zhang Daqian dated 1981 (H 45.5 x W 132 cm, mounted and framed, Auction Record: Sold price US$ 206,400 dollars at Christie's Hong Kong 2012 Autumn Auction  Sale 2961/Lot 1261 on 11/27/2012.). Splashed ink and color on paper, mounted, signed 1979 AUTUMN WRITTEN IN MOYEJINGSHE 81 YEARS OLD MAN YUAN, inscribed THE MAPLE LEAVES ARE STILL IN WIND, THE MOUNTAINS ARE STILL SO GREEN, IT'S SHINY ALL DAY TILL LATE, IT'S STILL SO WARM IN THE OLD FOREST, with four seals of the artist. Splendid golden-outline splashed ink and color on paper, mounted, signed 80 YEARS OLD MAN YUAN, inscribed 1978 IN MOYEJINGSHE, with three seals of the artist. Ink and color on paper, mounted, signed Dec.1946 DAQIAN ZHANG YUAN, inscribed and titled PAINTING THE ELDER BINTOURLU AFTER TECHNIQUE OF SONG DYNASTY, with five seals of the artist. Ink and color on paper, mounted, signed SHU JUN JIN SHI NAN ZHANG DAQIAN YUAN, inscribed and titled ONE FLOWER IN ONE WORLD AND THREE COMPREHENSIONS OUT OF THREE INSIGNIFICANCIES, MARCH 1978, dedicated BUDDHIST MASTER XING YUN AS WITNESS, with five seals of the artist. The handwritings and signature of Zhang Daqian in this painting are the same as those 29 words in the sister painting 《One Flower in One World White Lotus》(H 94 x W 212.5 cm, Feb.2nd, 1978, sold twice US 3.86 million dollars in total by Buddist Master Xing Yun in Feb.27th, 1994 at the Auction held for the Foundation Fund of Buddhist University.) by Zhang Daqian. The dedication of painting 《One Flower in One World White Lotus》by Zhang Daqian to Buddhist Master Xing Yun in March 1978 was recorded in Buddhist Master Xing Yun's personal Diary, the Buddhist Textbook Lesson 20, Volume 11 《The Memorabilia of Buddhist Mt. Fo Guang》 of Buddhist University, and the 《The Memorabilia of Founder Master Xing Yun of Buddhist Mt. Fo Guang》. Ink and color on paper, mounted, signed BAISHI OLD MAN, inscribed 89 YEARS OLD, with two seals of the artist. Ink and color on paper, mounted, signed and inscribed 91 YEARS OLD MAN BAISHI, with three seals of the artist. Ink and color on paper, mounted, signed and inscribed BEIHONG 1940, with four seals of the artist. Another one with the same artist and content was collected in Moscow Museum. The other was exhibited in Singapore Art Museum from 2008-04-05 to 2008-08-17. Another sister painting with the same artist and content was collected in Beijing Xu Beihong Museum China. Ink and color on paper, mounted, signed TU 1982, inscribed and titled MALI VILLAGE, with one seal of the artist. 吴冠中曾经谈到: "我的画是将西画的优点表现在中国画之中. 我画的点和线, 每一笔都包括了体面的结构关系. 画中的点和线, 不管是大点小点, 长线短线, 在运用上是严格的, 都不是随便乱摆上去的, 有时一点不能多也不能少, 点子多了对画面无补, 我都想办法将他遮掉. 对线的长短也是如此, 都不是随便画上去的, 要恰到好处.". 因此, 此幅吳冠中1990年作 "荷花" 圖名畫, 即是吴冠中画的点和线的结构关系間之最佳詮釋. 而此幅作品之第 2 幅姐妹作吳冠中 1990 年作"荷花" (H 70 x W 70 cm) 水墨設色紙本, 與此幅作品之年代, 內容, 題識簽名, 及 2 個鈐印皆完全相同, 係著錄於香港翰墨軒出版有限公司於 1995 年 10 月 27 日出版發行之 "名家翰墨叢刊 中國近代名家書畫全集 第12冊 吳冠中/尋故人 第68頁圖". 而此兩幅作品之題識簽名 "吳冠中 一九九O" 七個文字, 經過科學筆跡比對鑑定分析, 兩者皆係出自吳冠中本人之親筆書寫筆跡, 而且完全相同. 第 3 幅姐妹作吳冠中 1990 年作 "荷花" (H 70 x W 140 cm) 水墨設色紙本, 與此幅作品之年代, 內容, 簽名, 及1個鈐印 "冠中寫生" 皆完全相同, 現藏上海美術館, 題識: "接天蓮葉, 綫曲屈, 勝于碧", 係著錄於香港翰墨軒出版有限公司於 1995 年 10 月 27 日出版發行之 "名家翰墨叢刊 中國近代名家書畫全集 第12冊 吳冠中/尋故人 第 70 頁圖". 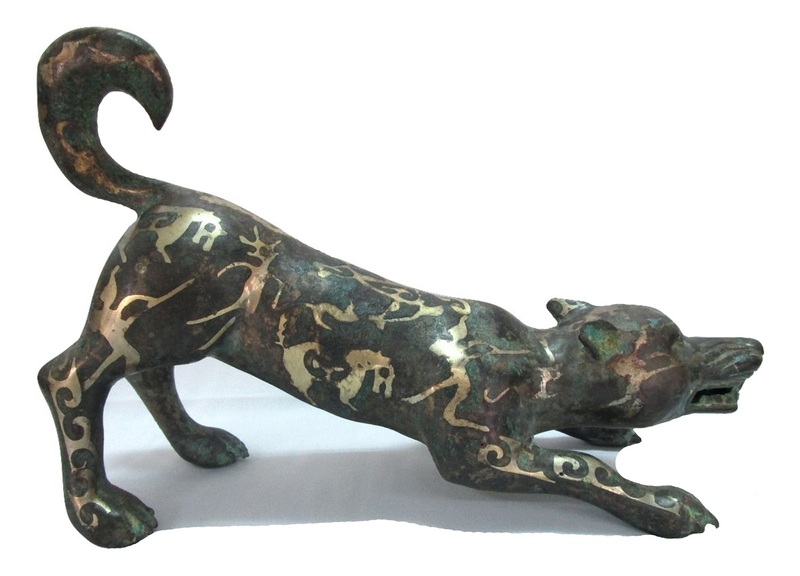 第 4 幅姐妹作吳冠中 1990 年作 "荷花" (H 69 x W 68.5 cm) 水墨設色紙本, 與此幅作品之年代, 內容, 簽名, 及1個鈐印 "九十年代" 皆完全相同, 係著錄於香港藝術家出版社於 1990 年 8 月出版發行之 "吳冠中畫集 第 82 頁圖". 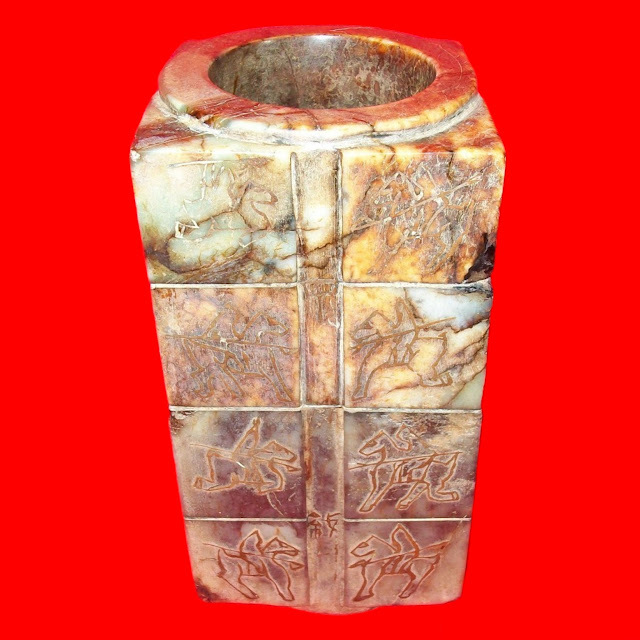 第 5 幅姐妹作吳冠中 1990 年作 "接天蓮葉勝於碧荷花圖" (H 70 x W 70 cm) 水墨設色紙本, 與此幅作品之年代, 內容, 簽名, 及 2 個鈐印 "冠中寫生, 九十年代." 皆完全相同, 題識: "接天蓮葉, 形綫曲折, 勝于碧", 係著錄於 "吳冠中自選畫集", 東方出版社, 建築與城市出版社有限公司, 1992 年出版. "吳冠中作品賞鑒" 1993 年月曆, 中國攝影出版社(附月曆), 陳嘉庚國際學會會訊 第一期封三, 1994 年. 第 6 幅姐妹作吳冠中 1990 年作 "接天蓮葉荷花圖" (H 96.6 x W 180.2 cm) 水墨設色紙本, 鏡心, 與此幅作品之年代, 簽名, 及 1 個鈐印 "冠中寫生" 皆完全相同, 題識: "接天蓮葉, 綫曲屈, 勝于碧", 係著錄於 "散珍集成" 第 218 至 219 頁, 河北教育出版社, 2005 年 5 月出版. "吳冠中畫展" 第 22 頁, (北京) 深巷畫廊, 2006 年 5 月. "藝冠中外" 第 84 至 85 頁, 百雅軒文化藝術機構, 2008 年 7 月出版. 拍賣記錄為: 2010 年 11 月 21 日北京誠軒拍賣有限公司 2010 年秋季拍賣會中國書畫 (二) Lot. 0313 拍賣成交價: 美金 US$ 935,580 元. Ink and color on paper, mounted and framed, signed WU GUANZHONG 1990, with two seals of the artist. The 2nd sister painting “Lotus” by Wu Guanzhong dated 1990 (H 70 x W 70 cm, Literature: “Paintings of Chinese Modern Renowned Artists” Volume 12, Page 68, Wu Guanzhong, published by Hong Kong Hanmoxuan Publishing Company on Oct. 27th, 1995.) has the same Signature and Year handwritings as this one. The 3rd sister painting “Lotus” by Wu Guanzhong dated 1990 (H 70 x W 140 cm) is collected by Shanghai Art Museum. Wu Guanzhong said: "My paintings demonstrate the advantages of the western style merged into Chinese ones. Every dot and line painted by me includes the linking structure relation between plane and volume. The dots and lines at my paintings, no matter they are big or small dots, long or short lines, are not randomly placed. They are used carefully in strict requirements. Sometimes they are not even one dot more or less. Too many dots are needless by the paintings. Therefore sometimes I have to mask surplus dots. So are the lines in their length. They are not randomly painted and must be put precisely in point.". Thus this “Lotus” was the best explanation of the painting theory about dots and lines created by Wu Guanzhong. The 4th sister painting “Lotus” by Wu Guanzhong dated 1990 (H 69 x W 68.5 cm, Literature: “Paintings of Wu Guanzhong” Page 82, published by Hong Kong Artist Publishing Company in Aug., 1990.) has also the same Signature and Year handwritings as this one. The 5th sister painting “Lotus” by Wu Guanzhong dated 1990 (H 70 x W 70 cm, Literature: “Paintings selected by Wu Guanzhong”, published by Hong Kong Oriental Publishing Company, Architecture and City Publishing Company, in 1992.) has also the same Signature and Year handwritings with the same two seals as this one. The 6th sister painting “Lotus” by Wu Guanzhong dated 1990 (H 96.6 x W 180.2 cm, Literature: “The Collection of Lost Art”, page 218–219, published by Hebei Educational Publishing Company in May 2005. Auction record: Sold US$ 935,580 by Beijing ChengXuan Auctions Co., Ltd. at 2010 Autumn Auction Chinese paintings  Lot. 0313 on Nov. 21st, 2010. ) has also the same Signature and Year handwritings with the same one seal as this one. Horizontal ink and color on paper, mounted, signed YEAR 1987 SUMMER PAINTED BY KERAN, inscribed and titled THE LANDSCAPE OF RIVER LI BEING WELL-KNOWN FOREVER, with two seals of the artist. Ink and color on paper, mounted, signed Lin Fengmian, with one seal of the artist. Ink and color on paper, four hanging scrolls, four screen quadruplets, all four paintings were signed CHANG BAI YAN BOLONG, inscribed AFTER THE PEOPLE IN YUAN DYNASTY AT CHUN CAO TANG IN THE NEW SPRING OF 1943, and each with two seals of the artist. 題識曰: "掀天揭地之文, 震電驚雷之字, 呵神罵鬼之談, 無古無今之畫, 固不在尋常蹊徑中也. 未畫以前, 不立一格; 既畫之後, 不留一格. 乾隆甲申為茂林年學兄哂正. 板橋鄭燮.". 鄭板橋1756年作 《竹石兰蕙图》 (高 186.5 x 寬 96.0 cm,水墨紙本立轴) 2011年6月7日於中国北京北京匡时国际拍卖有限公司2011春季艺术品拍卖会扬州画派作品专场 Lot. 1059 售出美金 US 6,176,000 元. Ink on Paper, Mounted, signed Banqiao Zheng Xie, inscribed ARTICLES THAT OPEN AND OVERTHROW HEAVEN AND EARTH, WORDS THAT SHOCK AND FRIGHTEN LIGHTNING AND THUNDER, TALKS THAT SCORE AND BLAME GOD AND GHOST, A PAINTING THAT HAS NOT BEEN EXISTED IN THE PAST AND WILL NOT BE DONE IN THE NEAR FUTURE, ARE ALL NOT ON THE USUAL ROUTE OR COMMON WAY. NEVER TO HAVE A STYLE BEFORE YOU START TO PAINT AND NEVER TO HAVE A STYLE LEFT AFTER YOU FINISH A PAINTING, dedicated QIANLONG JIASHEN (QIANLONG YEAR 29 A.D. 1764) PAINTED FOR MAO LIN NIAN XUE BROTHER TO INSTRUCT, with two seals of the artist and one authenticity appreciation seal of Yangzhou City Museum China. ARTICLES THAT OPEN AND OVERTHROW HEAVEN AND EARTH, WORDS THAT SHOCK AND FRIGHTEN LIGHTNING AND THUNDER, TALKS THAT SCORE AND BLAME GOD AND GHOST, A PAINTING THAT HAS NOT BEEN EXISTED IN THE PAST AND WILL NOT BE DONE IN THE NEAR FUTURE, ARE ALL NOT ON THE USUAL ROUTE OR COMMON WAY. NEVER TO HAVE A STYLE BEFORE YOU START TO PAINT AND NEVER TO HAVE A STYLE LEFT AFTER YOU FINISH A PAINTING, dedicated QIANLONG JIASHEN (QIANLONG YEAR 29 A.D. 1764) PAINTED FOR MAO LIN NIAN XUE BROTHER TO INSTRUCT, BANQIAO ZHENG XIE. The 《Bamboo and calligraphy》 (H 186.5 x W 96.0 cm, ink on paper, hanging scroll) by Zheng Banqiao dated 1756 was sold US 6,176,000 dollars at Beijing Council International Auctions Beijing China 2011 Spring Auction Lot. 1059 on 06/07/2011. Ink and color on Qing Kangxi old silk, mounted and scrolled, signed WANG HUI, inscribed THE SUNSHINE REFLECTS A LITTLE GREEN MISTY LIGHT OF MOUNTAIN; THE AUTUMN IS CHILLY WITH DARK GREENISH BLACK COLOR, with two seals of the artist. Remarks: In end Qianlong period Qing dynasty, Emperor Qianlong ordered to set Palace Zhong Hua Gong as an imperial extraordinary museum to place the various imperial precious artifacts of his grandfather Emperor Kangxi and his father Emperor Yongzheng. 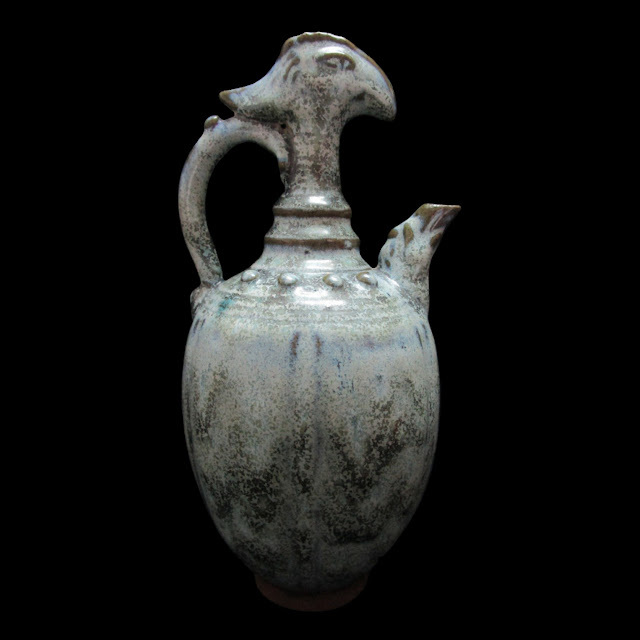 This Tang Lushan kiln copper-green glazed varicolored glaze-color-change-in-kiln pottery chicken-head jug has the features of the Tang Lushan Kiln Tang dynasty as earthworm-crawling-in-mud glaze-flowing lines, varicolored glaze-color-change-in-kiln, and iron-dark-foot. Its glazing is not down to the bottom of the foot. The edge of the glaze at foot is not neat and there are several teardrops of glaze there. 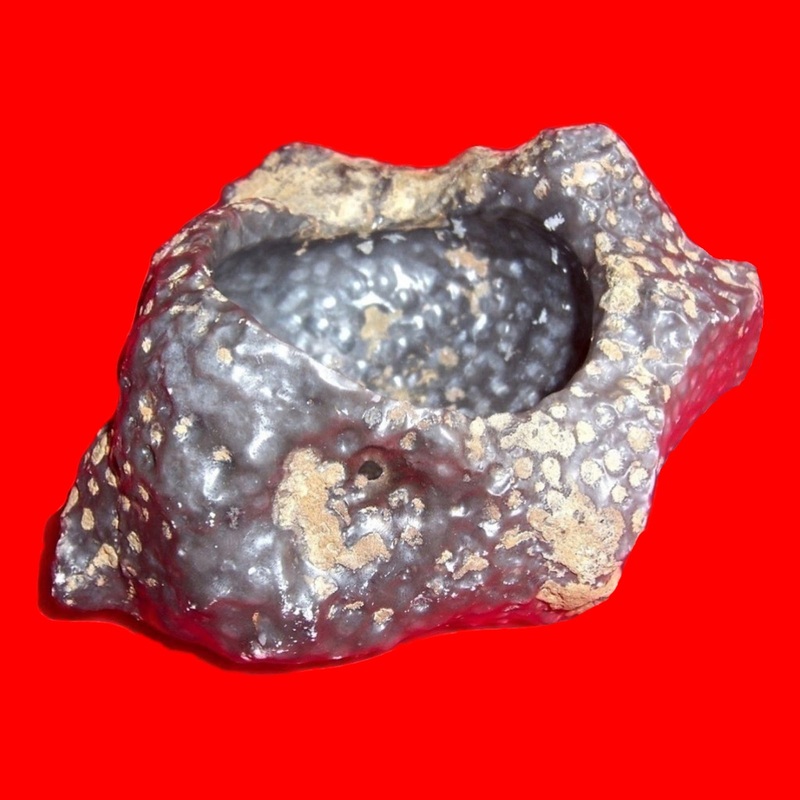 Its round mouth is located inside the foot ring at the inner bottom of the foot and both are exposed to dark-brown pottery clay. The techniques of making its round mouth to be located inside the foot ring at the inner bottom of the foot and varicolored glaze-color-change-in-kiln are very excellent and complex. A modern faker can’t afford to make it. It’s indeed a very valuable antique! The Northern Song Jun kiln was derived from the Tang Lushan kiln, so the Tang Lushan kiln is also named as Tang Jun Kiln. 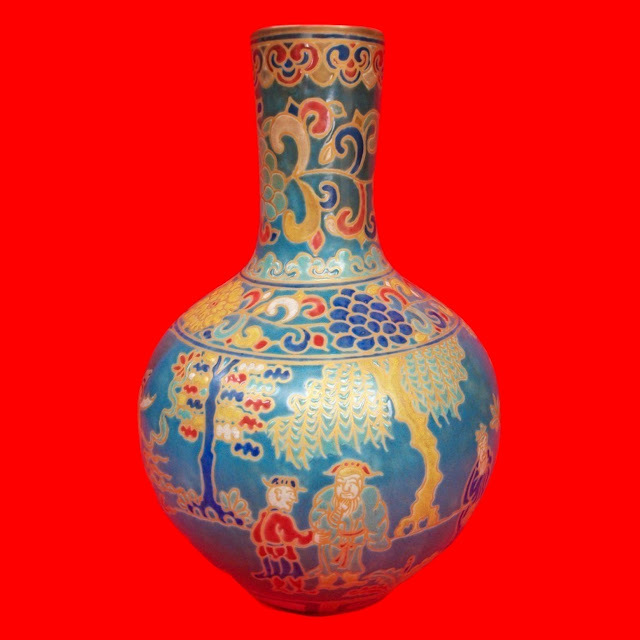 Among its porcelain and pottery products, the varicolored glaze-color-change-in-kiln ones are the most well-known. Nevertheless they were inherited and handed down from generation to generation quite few. Thus among large and famous museums worldwide, only a Tang Lushan kiln black glazed blue-varicolored glaze-color-change-in-kiln pottery pot (Height 5.6 x Mouth Diameter 7.5 x round Base-stand foot Diameter 8.6 cm) was collected by the Beijing Palace Museum in China. The three burning-supporting nail-head marks of this Tang Sancai round Box with Cover at the outer bottom and the inner cover have the same burning techniques as the three burning-supporting nail-head model in the Tang Sancai kiln unearthed at the Huang Ye Kiln in Gong YI City Henan Province China and this unearthed kiln was a very important Tang Sancai kiln in Tang dynasty. There is a similar Tang Sancai Pottery round Box with Cover collected by the Victoria and Albert Museum in the United Kingdom (Museum number: C.13&A-1935 Diameter: 8.3 cm). A Silver embellished Bronze carved Ritual Meat Vessel Dou shaped “Di Si Ding and Nien Heng Zi Ding” Heir Apparent Symbol of Royal Authority Ding for the reign of Nation Zhou by Bo Yikao to younger brother Ji Fa who defeated the King Zhou of Shang dynasty and became the founder King Wu of Zhou dynasty during the reign of the King Zhou of Shang dynasty China from 1075 B.C. to 1046 B.C. 商朝甲骨金文銘文: “ 子月寅年, 作弟姒鼎. 發文, 兄供作. 年亨子鼎, 子子作朕王用. ”. 商朝甲骨金文銘文及其釋文: “ (建周首年首月)子月寅年, 作弟(姬發)姒(周國母后太姒)鼎. 發(姬發)文(作銘文), 兄(姬發長兄伯邑考)供作. 年(周國年運)亨(亨通)子(萬世子子孫孫永傳)鼎, 子子(萬世子子孫孫永傳)作朕王(我周國王)用. ”. 西元前1075年至西元前1046年殷商紂王時期, 周氏族首領西伯姬昌被殷商紂王囚為人質, 他的王位繼承人嫡長子伯邑考欲至商朝首都請求殷商紂王釋放他父親西伯姬昌. 臨行前深知他被殘暴殷商紂王處決的危險性, 他作此鼎以作為周國的傳國王位鼎. 以免萬一他和父親皆被殘暴殷商紂王處決後, 周國將無世襲王位繼承人嫡長子可當領袖國王. 最後此鼎的作者伯邑考仍被殘暴的殷商紂王處決並剁成肉醬予西伯姬昌吃食自己的孩子作為釋放的強迫性處罰. 由於從他的嫡長兄伯邑考取得此鼎, 姬發終於統治周國並於西元前1046年年初擊敗殲滅殘暴的殷商紂王而建立了周王朝. A Silver embellished Bronze carved Ritual Meat Vessel Dou shaped “Di (eldest younger-brother Ji Fa) Si (Queen-Mother Tai Si) Ding and Nien (National Years of Zhou) Heng (Being Well) Zi (for Sons and grand-Sons of future generations forever) Ding” Heir Apparent Symbol of Royal Authority Ding for the reign of Nation Zhou by Bo Yikao (eldest-brother of Ji Fa who destroyed and defeated the King Zhou of Shang dynasty and became the founder King Wu of Zhou dynasty in early 1046 B.C.) during the reign of the King Zhou of Shang dynasty China from 1075 B.C. to 1046 B.C. The inscription in oracle-bone scriptures of Shang dynasty: “ Zi Yue Yin Nien, Zuo Di Si Ding. Fa Wen, Xiong Gong Zuo. Nien Heng Zi Ding, Zi Zi Zuo Zhen Wang Yong. ”. The inscription in oracle-bone scriptures of Shang dynasty with English translation by words: “ Zi Yue (in the first month) Yin Nien (first year of foundation of Zhou Nation), Zuo (made this) Di (for younger-brother Ji Fa) Si (and for Queen-Mother Tai Si) Ding (as an Heir Apparent Symbol of Royal Authority Ding for the reign of Nation Zhou). Fa (Ji Fa) Wen (he wrote inscription), Xiong (eldest-brother of Ji Fa i.e. Bo Yikao) Gong Zuo (I dedicatedly made this). Nien (National Years of Zhou Nation) Heng (Being Well) Zi (for Sons and grand-Sons of future generations forever) Ding (as an Heir Apparent Symbol of Royal Authority Ding for the reign of Nation Zhou), Zi Zi (for Sons and grand-Sons of future generations forever) Zuo (to be) Zhen Wang (our King) Yong (used as an Heir Apparent Symbol of Royal Authority for the reign of Nation Zhou). ”. The inscription in English translation: “In the first month and first year of the national foundation of Zhou Nation, I (Bo Yikao) made this Ding for my younger-brother Ji Fa and for my Queen-Mother Tai Si as an Heir Apparent Symbol of Royal Authority Ding for the reign of Nation Zhou. Ji Fa wrote the inscription and I dedicatedly made this Ding. Long Live the National Years of Zhou Nation to be well and for our sons and grand-sons of future generations forever! Long Live this Ding to be an Heir Apparent Symbol of Royal Authority Ding for the reign of Nation Zhou! Our sons and grand-sons of future generations forever shall be our King by possessing this Ding as an Heir Apparent Symbol of Royal Authority for the reign of Nation Zhou forever and forever. ”. During the reign of the King Zhou of Shang dynasty China from 1075 B.C. to 1046 B.C. the Leader (Xi Bo Ji Chang) of Zhou Nation was put in jail as a hostage by the King Zhou of Shang dynasty. His eldest son Bo Yikao as an Heir of Royal Authority for the reign of Nation Zhou intended to go to the capital of Shang dynasty for asking for a favor to release Xi Bo Ji Chang from the King Zhou of Shang dynasty. Before his departure he had been fully aware of the danger of being executed by the cruel King Zhou of Shang dynasty. Therefore he made this Ding as an Heir Apparent Symbol of Royal Authority Ding for the reign of Nation Zhou lest he should have had no nominated leading Hair of Royal Authority for the reign of Nation Zhou once he and his father were both executed by the cruel King Zhou of Shang dynasty. Finally the artist of this Ding Bo Yikao was executed and cooked as a meat for Xi Bo Ji Chang to eat his son as a forced punishment to be released. 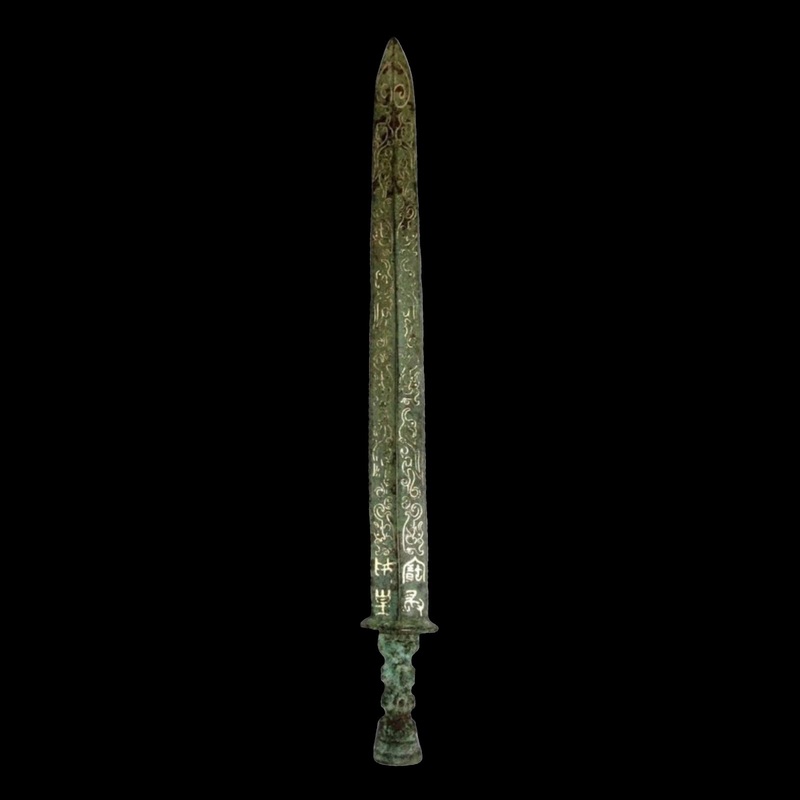 By possessing this Ding from Bo Yikao (the eldest-brother of Ji Fa) Ji Fa reigned over Nation Zhou successfully and finally destroyed and defeated the cruel King Zhou of Shang dynasty and became the founder King Wu of Zhou dynasty in early 1046 B.C..
A Bronze carved Sword of Emperor Wen (Liu Huan) with greater Phoenix and little Dragon Totems Designs and inscription of “Honorable Heritage from Mother Empress” Western Han dynasty China from 179 B.C. to 157 B.C. 2015年12月16日在法國巴黎舉行的蘇富比尚古彌珍－大維威爾中國古代藝術品珍藏拍賣會圖錄 Lot. 15 及 Lot. 41中列有兩把中國東周戰國時期無銘文且無紋青銅古劍. 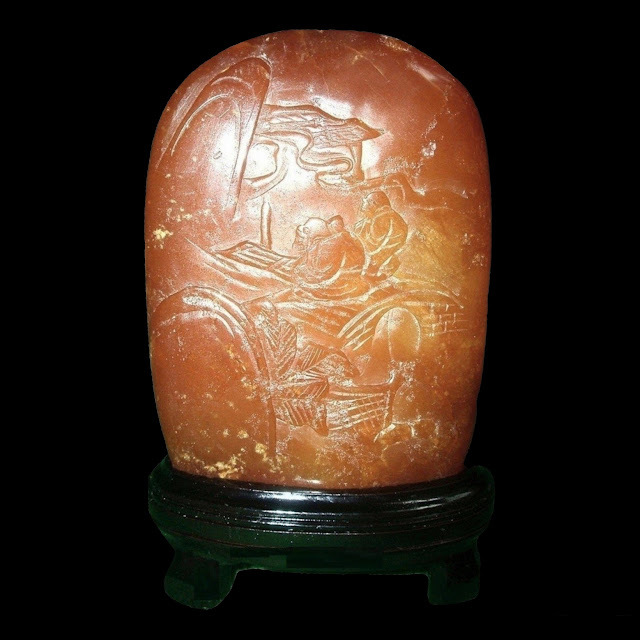 The inscription in oracle-bone scriptures of Shang dynasty at the sword: “Bao Cheng Bi Huang”. The inscription in oracle-bone scriptures of Shang dynasty at the sword with English translation by words: “Bao (Honorable) Cheng (Heritage) Bi (deceased Mother) Huang (Empress)”. The inscription in oracle-bone scriptures of Shang dynasty at the sword with English translation: “Honorable Heritage from Mother Empress (The first ruling reign of an Empress in Chinese history, Han Gao Hou〔reign 187 B.C. - 180 B.C.〕Empress Lu Zhi〔born 241 B.C. - 180 B.C.〕)”. There are two archaic BRONZE SWORDs in WARRING STATES PERIOD EASTERN ZHOU DYNASTY China without any totem and inscription listed on the Sotheby’s auction catalogue of “TRÉSORS DE LA CHINE ANCIENNE DE LA COLLECTION DAVID DAVID-WEILL” Lot. 15 and 41 dated 16 December 2015 held in Paris France. A Bronze carved Ritual Wine Vessel Ewer Livestock GONG Shang Dynasty China from 1600 B.C. to 1046 B.C. 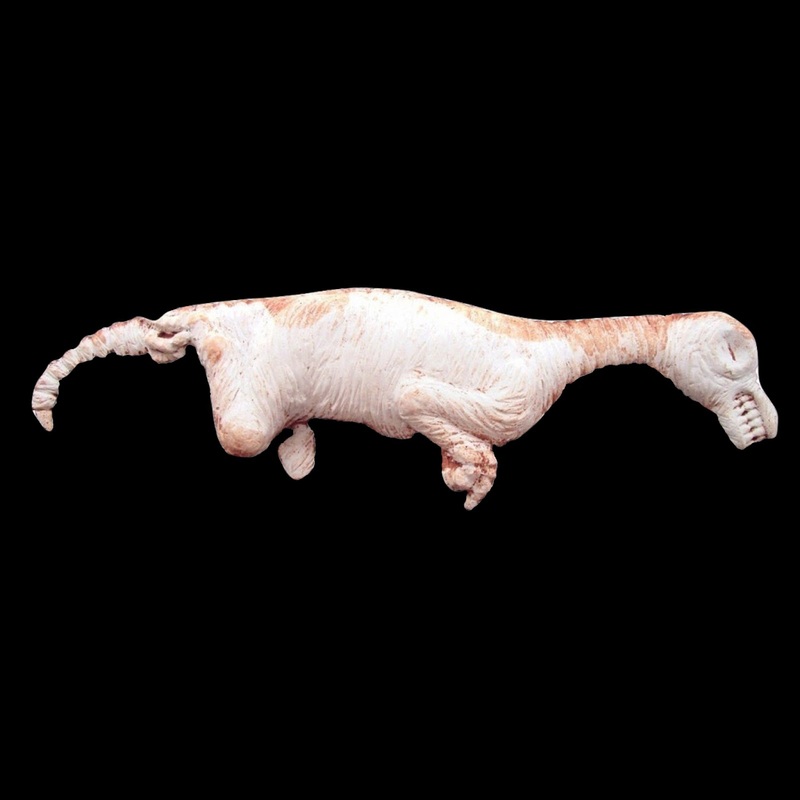 美國華盛頓特區之 Freer 美術館 (Arthur M. Sackler 美術館與Freer 美術館組成Smithsonian 機構之國立亞洲藝術博物館) 收藏有一件西元前1100年至西元前1050年商朝末期特殊有蓋青銅羊角龍頭饕餮(古代貪吃獸)紋龍虎魚鳥象人蛇紋, 尾部牛角化成魚, 每一後足皆是刻人形裹於蛇盤圈, 前頭與把手刻鳥, 後足人形裹蛇紋之牺觥 (收錄編號: F1961.33a-b, 大小尺寸: 高 31.4 x 寬 31.5 x 深 14.4 公分, 歷史時期: 大約西元前1100年至西元前1050年中國.). An extraordinary bronze carved lidded ritual wine vessel ewer (Livestock GONG) with designs of taotie (an ancient Chinese mythical gluttonous beast), dragons, tigers, fish, birds, humans, serpents, the ram's horns and mythical beast head in front, the beak of bird at the front, the bovine and deer horns at the middle, the standing bird on the handle, and the humans wrapped in snakes on the back legs Shang dynasty China from 1600 B.C. 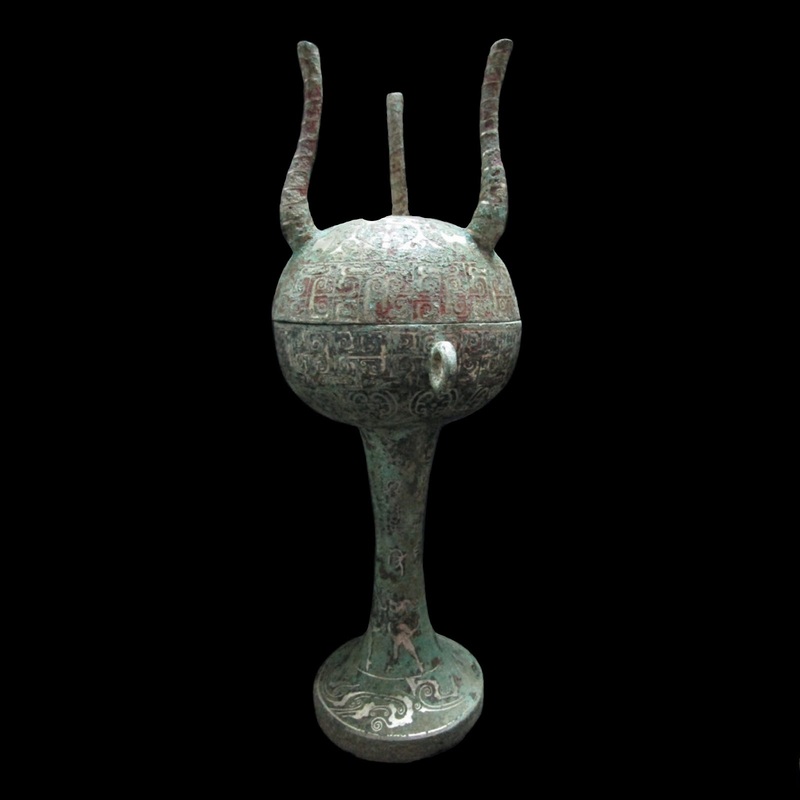 to 1046 B.C..
A bronze carved lidded ritual wine vessel ewer (Gong Fu Yi GONG) in end Shang dynasty from 13th century B.C. to 11th B.C. is collected by the Shanghai Museum China. An extraordinary bronze lidded ritual ewer (gong) with taotie, dragons, birds, tigers, elephants, fish, snakes, humans, the ram's horns in front are also dragons, the bovine horns in the back turn into fish, each hind leg is a human figure wrapped inside the coils of a serpent, the birds at the front and on the handles, and the humans wrapped in snakes on the back legs (ACCESSION NUMBER: F1961.33a-b, DIMENSION(S): 31.4 x 31.5 x 14.4 cm, HISTORICAL PERIOD(S): ca. 1100-1050 BCE, China) is collected by the Freer Gallery of Art (the Arthur M. Sackler Gallery and the Freer Gallery of Art form the Smithsonian Institution's national museums of Asian art) in Washington D.C. U.S.A.. 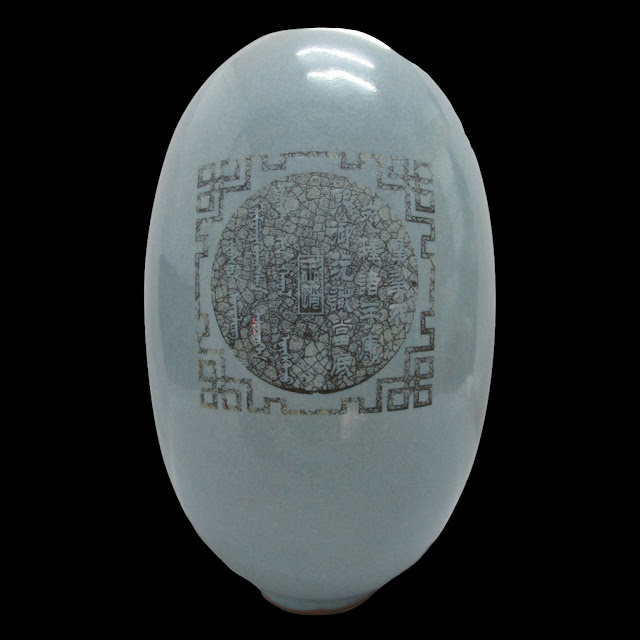 This Tianhuang Stone has the features of natural Tianhuang Stones such as texture of the radish grain, red-blood-vessel pattern, crack pattern, full transparency, frozen-honey-like appearance, dense, smooth, and delicate feeling by hand-touch, glossy and glassy luster, round and flat Tianhuang stone pebble with skin. 此藝術品已經具備有數千年之久的深度 "黃土沁色" 及其背部鈣化風化現象,可以說是世界上人類所創造的遠古最早期 "抽象派雕塑品", 其雕刻仍然甚為原始! It has been soaked with deep "Yellow-loess Soakage Color" and has calcification at the rear of sculpture over the past thousands of years. 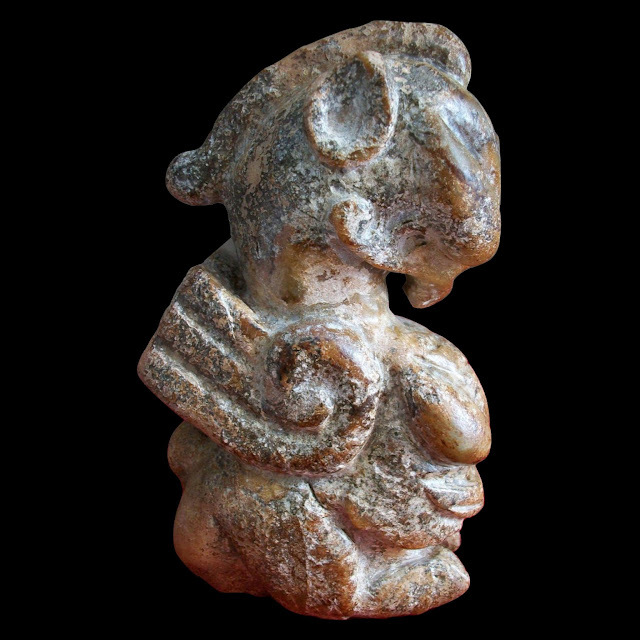 This work of art could be described as the far ancient earliest "Abstract Sculpture" created by people in the world! The carving of this beautiful work of art was still quite primitive. 銘文: 玉琮四面的每一面皆飾以將青銅鎔入玉面陰刻溝渠線紋的鑠金8幅騎兵乘戰馬持中戟以不同方位刺向敵人紋, 每面中間直線條中尚飾以秦文或秦相李斯所創小篆文字體 “中戟” 二文字. 此西元前475年至西元前206年中國東周戰國至秦朝時期古白玉雕騎兵戰馬中戟紋秦始皇帝崇武玉琮的古玉雕美麗藝術品, 其雕刻仍然甚為原始! 並非是使用現代的機械工具, 而是利用中國古代的 "手工兩邊穿洞雕法". 此 "古白玉雕騎兵戰馬中戟紋秦始皇帝崇武玉琮" 之雕琢厚實, 簡練, 而流暢, 其以手工從兩邊穿洞雕法所形成之洞中路徑不一致, 與方形玉柱體內鏤空穿過一大圓孔的方式, 皆為中國東周戰國至秦朝時期的常用玉琮雕琢工法. 而此工藝品之玉皮上, 亦具備有非常清楚與明顯的中國古老白玉黃土沁色. 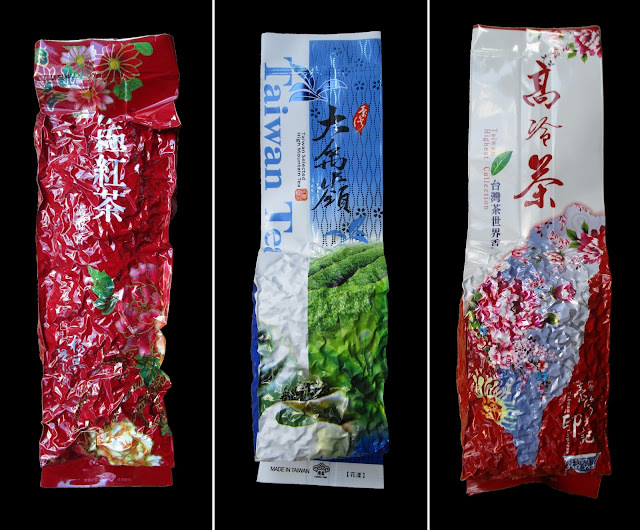 此出色極美之精美藝術品具備中國東周戰國至秦朝時期帝王玉工所雕 "秦國帝王尊貴威嚴的王者氣度神韻及秦朝秦始皇帝的崇武精神" 之極度流暢王玉工藝, 絕非是近現代玉工所能完成和仿制之, 為中國古代帝王所用帝王玉雕工藝的鬼斧神工絕美傑作. Inscription: Every Side of Cong has Eight Cavalrymen Totems each riding on War Horse and holding Halberd of Middle Size to stab at enemies from different directions and has also two Chinese ancient characters “Halberd of Middle Size” written in Qin Characters or Xiao Zhuan Characters that were invented by the Premier Li Si of Qin Dynasty at the middle vertical line part of Cong on its four sides. 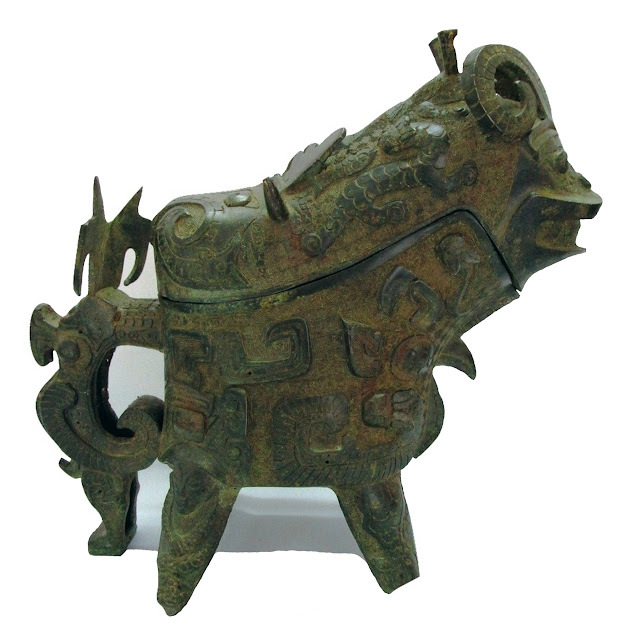 The Cavalrymen War Horses and Halberds of Middle Sizes Totems as well as the two Chinese ancient characters “Halberd of Middle Size” written in Qin Characters or Xiao Zhuan Characters were all using the melted copper to be filled into the carved incised feminine ditch lines forming new smooth surface. 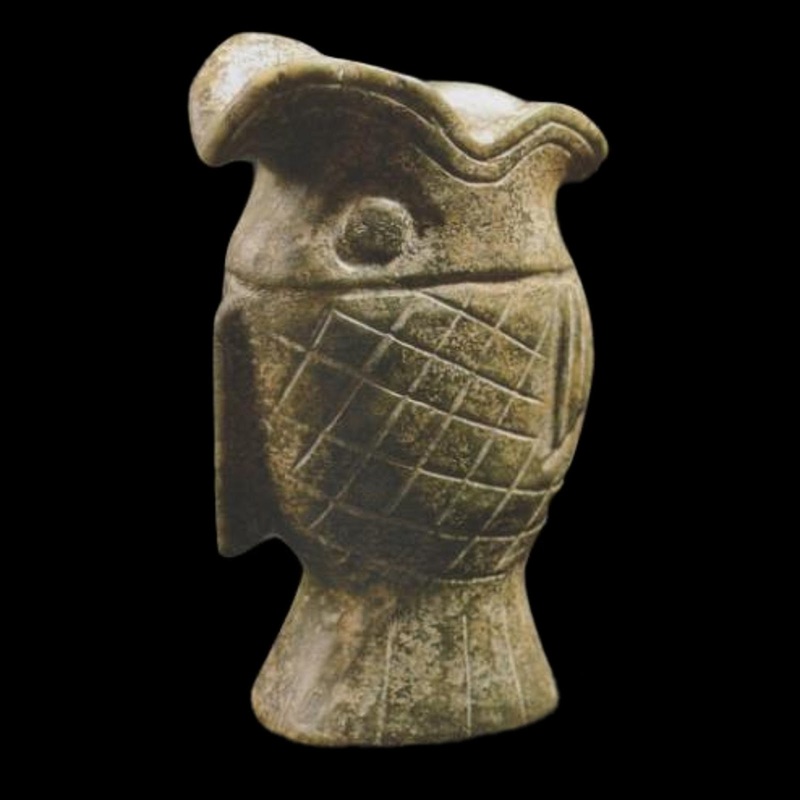 The carving of this beautiful work of art in 475 B.C. – 206 B.C. Eastern Zhou Dynasty Warring Times to Qin Dynasty China by Archaic Jade was still quite primitive and not made by modern machine tools, but using the popular "Handmade Hollowing-hole-from-two-sides Carvings" in ancient China. The carving techniques of this work of art were made simply, clearly, skillfully, and smoothly upon a thick and solid jade, the Handmade Hollowing-hole-from-two-sides Carvings forming path gaps between two holes from each side and a rectangular jade body carved with an inner hole were all the popular jade carved Cong working techniques used in Eastern Zhou Dynasty Warring Times to Qin Dynasty China. This work of art has also very clear and apparent yellow loess soakage color in the skin as the aged white jade in ancient China. Asian Art Museum located in San Francisco CA. 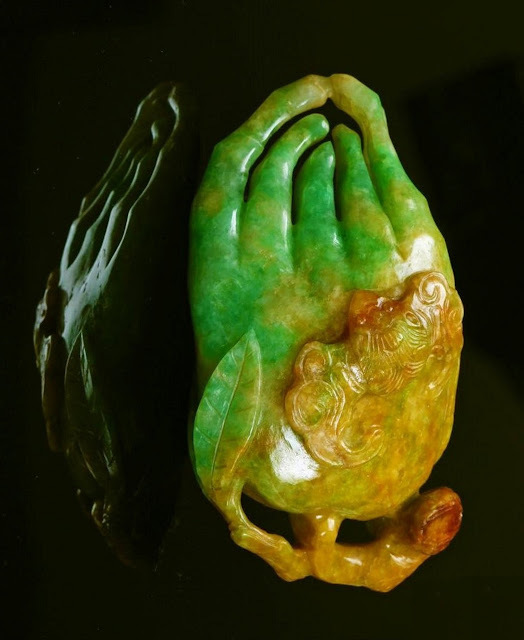 U.S.A. has collected two ancient "Jade carved Heaven Worship Congs of China". 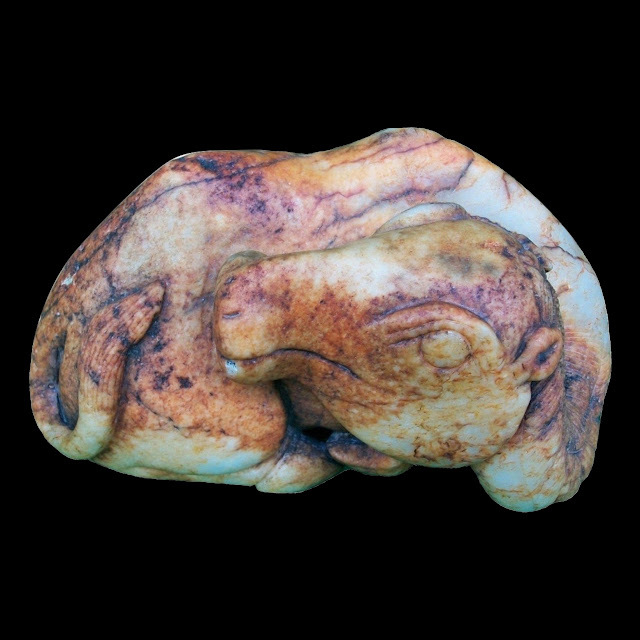 A Carved Archaic Jade Figure of a Sitting Double-humped Camel is collected by the Victoria and Albert Museum in the United Kingdom with Size: Length 9.8 cm. 5. Low supply of masterpieces reduces Western auctioneers’ turnover. 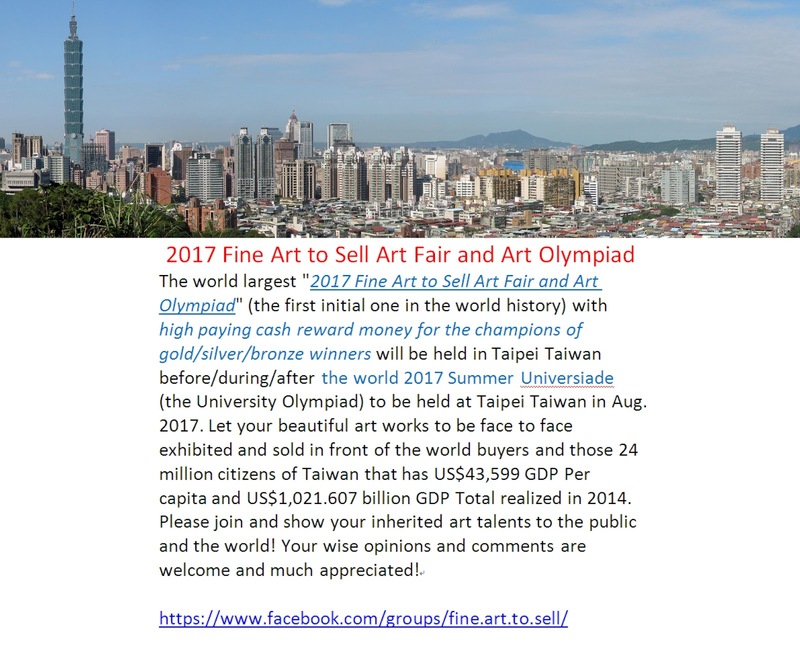 Worldwide, more than 252,000 Fine Art lots were sold in the first six months of 2016, generating a total turnover of $6.53 billion (including fees). Artprice, world leader in Art Market information since 1987, has systematically analysed over 3500 auction sales to produce a detailed half-year report covering public auctions of Fine Art (painting, sculpture, drawing, photography, printmaking and installations). Transactions rose 3.2% while sales turnover dropped -25%, almost entirely due to a reduced offer of major masterpieces (works priced over $10 million) in all artistic periods. According to thierry Ehrmann, Artprice’s founder and CEO, with its overall economy on meltdown watch for a number of semesters, China had been expected to lose its ‘soft power’ battle with the United States on the global art market this year. Its return to the global leader position with a turnover up by more than $570 million is therefore a major surprise. Another surprise on the global art market has been the generally low unsold rate and the dynamic pace of transaction growth, both clearly demonstrating the art market’s capacity for adjustment and safe-haven attractiveness compared with financial markets and standard investment returns. The slowdown was already visible in the second half of 2015 with the first signs of a fall in sales revenue since the financial crisis in 2008. Although the market was braced for some degree of contraction in the first half of 2016, it was not expecting a drop of this magnitude. An unfavourable comparison basis has significantly amplified the size of the contraction since the first half of 2015 posted absolutely historic highs, with a large volume of new auction records. Nevertheless, the heart of the Western art market appears to have retained its vitality. Nevertheless, the heart of the Western art market appears to have retained its vitality. The market’s overall unsold rate — a key marker of the art market’s health for two centuries (above 35% indicates meltdown territory… below 25% indicates a speculative dynamic) — is still 2 points below the indicator’s pivotal 30% level. The number of lots sold has also seen a significant 10% increase. During the first half of 2016, China beat the United States to first place on the global art market. The sharp contraction at the top of the US art market has allowed China back into the leader position on the global map of national markets, a development that no-one would have imagined last year. Indeed, Mainland China’s art market is still undergoing substantial readjustment: its secondary art market sold fewer lots (down 22%) and its overall unsold rate remains high (at 64%). But its total turnover on Fine Art only posted an +18% increase. China’s problem with unsettled bids has now been resolved by an extremely strict legal framework that has been in force for 2 years. Hong Kong — an integral part of the People’s Republic of China — is at the heart of the process of stabilisation of the Chinese market and is proving to be of paramount importance for the nation’s art market. Hong Kong is the only major marketplace in the world that has continued to post market growth (nearly +10%) and it is clearly keeping the Chinese art market alive. In New York, Christie's — the world’s leading auction operator — has posted a 56% drop in turnover on Fine Art. Its total for the first six months of 2016 was therefore less than half its turnover for the same year-earlier period. However, the downturn in revenue has not stopped Sotheby's (the only major auctioneer whose capital is traded on the stock market and listed in New York) from enjoying a 20.5% increase in its share price since 1 January 2016, suggesting that the financial markets are confident in the art market. Of course, the contraction in art market turnover appears all the more dramatic after the exceptionally strong results at the beginnings of both 2014 and 2015 with the secondary market majors posting their highest-ever sales totals and stunning new auction records. Last year, Artprice’s interim report clearly identified the “highly selective nature of the lots offered for sale and the rocketing prices of works by the market’s stars" during the first half of 2015. This dual phenomenon was symbolized by Christie's introducing a new sales format (mixed period sales) of which Looking Forward to the Past on 11 May 2015 was a stunning example. That evening sale demolished the all-time auction record for an artwork not once, but twice, with masterpieces by Giacometti and Picasso fetching respectively $141.3 million and $179.4 million. The sale also posted the highest-ever average hammer-price at $18.4 million. The shortage of masterpieces has been felt throughout the first half of 2016. Whereas Christie's hammered 31 results above $10 million last year, it only recorded 12 in the first half 2016, with a top price of just $57.3 million in New York. The lack of spectacular results seems to suggest the market has fallen asleep in 2016. However, this is clearly not the case since there has been more activity in H1 2016 than there was in H1 2015 with the Western art market posting a 9.7% increase in transactions and a 9.9% increase in its price index in the second quarter of the year. Indeed, the reluctance to part with major masterpieces is in sharp contrast with the enhanced liquidity of the works present on the art market. This intensification in the volume of transactions — with a stable unsold rate — confirms beyond any doubt the enhanced liquidity of the Western art market. Driven by investment logic, speculation, inspired collectors and an insatiable demand for major artworks from the world’s museum industry, the turnover total for the global secondary art market is in good health thanks to China and +18%. The art market has managed to post a better interim turnover total despite a deterioration in the global economic context. Apart from access to reliable art market information, the driving forces in today's art market are the rapid proliferation of online art sales (with 95% of the Art Market's players connected), the emergence of art as a reliable and interesting asset class, the massive growth of the art-consuming population (from roughly half a million in 1945 to around 70 million in 2016), the accession to the market of a much younger generation and an expansion of the market to Asia, the Pacific Rim, India, South Africa, the Middle East and South America. E-business is up 96% on the Art Market (Christie's, 25 July 2016, in Les Echos).